International Social Service, USA (ISS-USA) has partnered with Lumos to offer safe repatriation and reintegration planning for children returning to Guatemala after a forced separation at the US-Mexico border. Through the program, ISS-USA and our Guatemalan partner are providing reunification assessment services and intensive case management in Guatemala for children reuniting with families. Social work case management services include developing and implementing reintegration plans that address each family’s needs individually. These interventions can also prevent dangerous re-migration or the unnecessary institutionalization of children. Case managers working with the family for an initial period of six months help make connections that can stabilize a family during periods of transition and ensure children are accessing educational, health, social support and other services vital to their well-being. ISS-USA believes that all children and families separated, or facing separation, regardless of circumstance or citizenship status deserve services that help them stay safe and together. 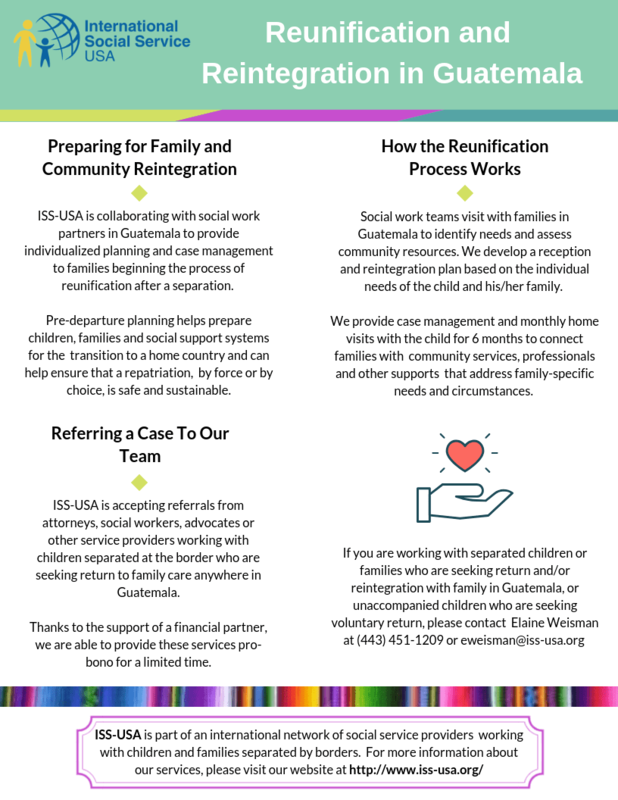 For more information on reintegration planning services or how to refer cases, please see the quick guide below, or view it on our website’s quick guides page. If you have any additional questions, please contact Elaine Weisman, Program and Training Manager, at eweisman@iss-usa.org.